Last week, Joanne Wagner got what —for her—is good news. The drilling company Range Resources withdrew its application to drill near her childrens’ school in Washington County, Pennsylvania. The company already developed one well nearby. The latest plan would have added three more. “Our school ultimately would be completely surrounded by wells,” if the plan had gone ahead, Wagner says. But citing low oil and gas prices, the company said it was backing off its drilling plans near Fort Cherry School District, a small district southwest of Pittsburgh. Fort Cherry is one of many school districts where drilling rigs are becoming commonplace. A 2013 report from the environmental group Penn Environment found 26 wells permitted in the state within a half-mile from a school. Sometimes the wells are tapping gas owned by neighbors—and sometimes it’s the schools themselves that are signing leases. Dozens of districts around the state have leased, including many in the southwest corner of the state. “There haven’t been any issues at all—we just get a check every month,” says Laura Shola, Business Manager at Avella Area School District in Washington County. Avella Area, which uses well water, had its water tested before drilling began. Range paid out a $110,500 a signing bonus. The closest well is about a mile from the school. The school district has received between $2,100 and $5,000 in monthly payments for their royalties from gas pulled from a neighboring well since early 2013. The 600-student district’s annual budget is around $10 million. “We haven’t earmarked (the drilling money) for anything specific—we use it to offset regular deficits,” Shola said. But when wells edge closer to schools, parents like Wagner, a Fort Cherry school board member, can get upset. “There are places for (drilling), but it is not near 1200 children at a school,” Wagner says. A Range Resources spokesman did not respond to interview requests. But in a written statement, said the company hoped to restart drilling in the area next year, and pointed out the district’s own study showed no air quality problems at the school during the fracking and flaring process at another well about a half-mile from the school. But these results don’t sway Pittsburgh pediatrician Edward Ketyer. He says some hazardous air pollutants—like the carcinogen benzene—can be released during fracking, and for that reason, he thinks drilling rigs should be kept far away from children. “Children are not little adults—children are different. They’re more susceptible to toxic chemicals because of their size and because of the normal processes of growth and development.” Ketyer says. Uncertainty about health impacts led New York state to ban fracking late last year. And it’s given parents like Crystal Yost, a stay-at-home mother in Mars Area School District, north of Pittsburgh, a reason to oppose a well near her daughters’ school. Rex Energy wants to drill a well a half mile from Centennial School, a half mile from where her twins, Elizabeth and Emily, attend sixth grade. Scientists have found health impacts as far as ten miles from fracking wells. A study in Pennsylvania found skin and lung problems were more common among people who lived within a half mile of wells. Those are preliminary studies and the industry has criticized their methods. But they give parents like Yost pause. Yost and other parents are fighting the placement of the wells before the Middlesex Township zoning hearing board. And it is likely that the case could go before a judge. Rex did not return calls seeking comment. Kim Geyer and her husband own the land where Rex wants to drill near the Mars Area schools. Geyer thinks her property rights are being squeezed by the local parents group. “We live on a farm—we’re following all the laws. If they have a problem with that they need to go to Harrisburg and change the laws,” Geyer says. New Pennsylvania Gov. Tom Wolf is reviewing the state’s oil and gas regulations. Among the issues he could try to address is drilling near schools. 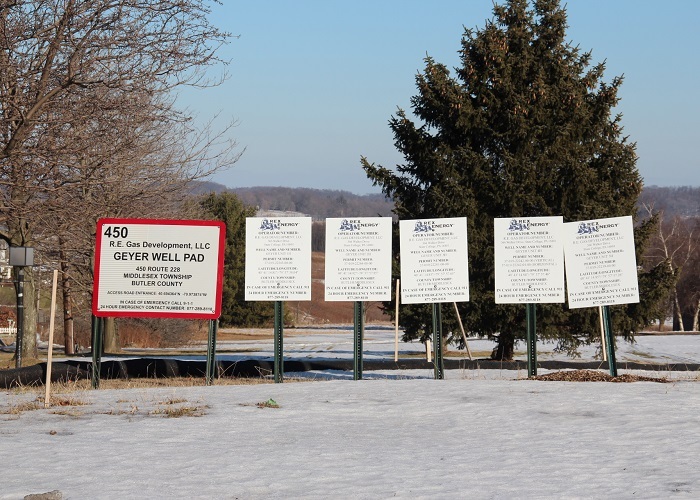 Photo: Reid R. Frazier: The Geyer well near Mars Area schools have caused controversy among parents and local landowners.